Thanks to all the Swan City Club members and sledders from the areas surrounding GP for their support of this event. A special thanks to those who helped make the field sessions fun and comfortable. These guys toured us around on our scouting days, graciously lent us their camp, a sled, kept the trail groomed, and of course shared beer & sledding stories. Hmm…Maybe more of our courses should be ‘camp style’! Scott Kozuback – Scotford Oilfield Cont. I would also like to thank my Zac’s Tracs team for helping us host an awesome class. 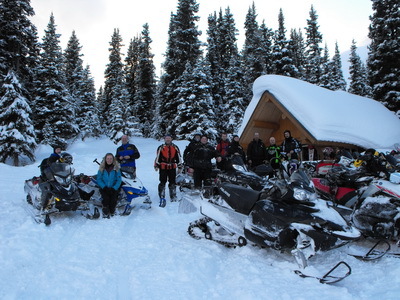 Over 110 sledders attended the Grande Prairie AST1 program. To ensure everything ran smoothly I gathered up a group of hardworking family, friends, and colleagues from the avalanche patch and the film industry. The participants enjoyed the hands-on nature of the course (no…those aren’t frowns on their faces…everyone is deep in concentration!). 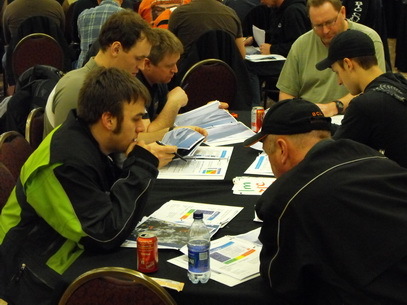 The color workbooks, including terrain photos, key concepts and case studies were well received. 10 points to anyone that can guess these 2 killer terrain features! So I’m not much of an artist…but I’ll bet you never forget them once you figure them out. Tables were set up at the back of the room to encourage groups to spread out and get comfortable for informal discussions of the course material. Randy and I were joined by Peter Marshall, a forecaster with the Canadian Avalanche Centre, Carole Savage and Grant Winkler for the field sessions. 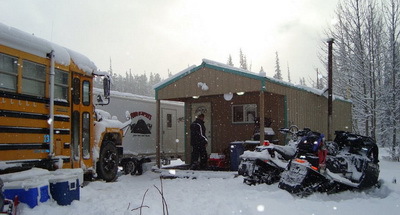 We spent 5 days in the Kakwa scouting and instructing. Loaded down with coolers of food and barrels of fuel and we felt ready for the marathon! A few more scouting days and we’ll be sure to make a sledder out of Peter! Thanks again to the enthusiastic students and crew that we met in GP. We have never received so many phone calls and hand shakes for a job well done. We look forward to returning next season! Deanna, Sales and Catering Coordinator for the Quality Inn, Grande Prairie was great to work with. Deanna was very flexible with our room and AV needs.